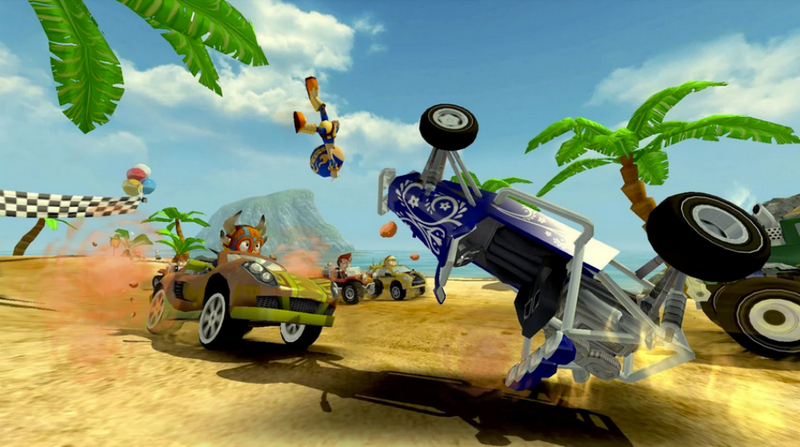 A new game from the makers of Beach Buggy Blitz hit Google Play today, a sequel of sorts, titled Beach Buggy Racing. The first game was geared more towards single player action, where players would race through sand dunes and volcanoes, hoping to collect enough coins and power-ups to upgrade characters and vehicles. In this new title, racing against other real-person opponents is the name of the game, bringing a completely new level of difficulty to the franchise. In essence, think of it like Mario Kart, where users can use power-ups against each other, ultimately trying to win the race to earn enough coins to continuously upgrade their car. The game features a ton of different vehicles to choose from, teams of drivers to collect, gorgeous levels to race on, and full Google Play Services integration for racing with your buddies. The game is free to download, but does feature IAPs. These IAPs are used to upgrade your car quicker, but don’t worry, you do not need to pay to win. All you need are your driving skills.